Roof drains for flat or low-slope roofs come in a few standard types. The best type for the application depends on several factors, such as the size and slope of the roof, the desired appearance, and how much regular maintenance the drain system might need. Sizing the drains for each system, including the number of drains required, is based on factors such as the roof area, the drain location(s), the inflow rate and desired drainage rate, and the expected rainfall volume. The first step in sizing a roof drain is to calculate the surface area of the roof that the drains will be covering as well as the average hourly rainfall rate at the building location. The next step is to determine each roof area that will be served by a separate leader (drain pipe, scupper, or downspout). This information can be obtained from the pipe or drain manufacturer. Next, the roof area is divided by the area for each leader to determine the number of drains required. Each leader must be large enough to handle the volume of water to be drained—the greater the leader capacity, the fewer roof drains are needed. In general, roof drains are spaced equally and are located in low points of the roof or in any areas where water accumulates. Conventional gutter systems, such as those used on most houses, are suitable for some low-slope roofs that have a slope greater than 2 percent. (A slope of less than 2 percent is considered a flat roof.) 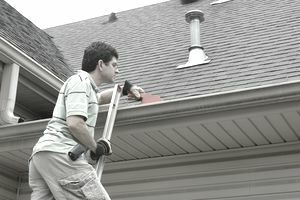 Gutters are simple and inexpensive but require frequent cleaning. Even a small amount of blockage from debris can cause a gutter to overflow. Located at the bottom edge(s) of the roof, gutters typically are fully visible and have downspouts mounted to the side walls of the building. Scuppers are commonly used on flat roofs that have a parapet or other type of perimeter barrier enclosing the roof. Scuppers are open holes or channels cut into the roof edge or parapet. The roof is sloped toward the scuppers, and water simply drains out through the scuppers. A scupper may drain into a downspout on the exterior of the building, or it may have an extended chute or pipe that directs a stream of water away from the building. Inner roof drains are used on flat roofs and include a low section or channel that collects water and feeds it into a concealed drain that leads to an underground drainage system. The main benefit of inner drains is that the system is hidden from view. Inner drains are resistant to freezing but can require careful maintenance to prevent problems. A siphonic roof drain utilizes siphoning as a drainage mechanism, resulting in drainage that is faster than that on any other type of roof drain. Commonly used on flat commercial roofs, siphonic drains allow for a minimal number of drains, and all of the drains can be connected to a single leader. Siphonic drains typically cost more than other drain systems, but they work smoothly and require relatively little maintenance. Because the siphoning force helps move the water, siphonic drain systems can employ horizontal leaders instead of sloped pipes, which rely on gravity alone for drainage.